Two teenage thugs got what they deserved last Friday when a woman they tried to attack turned out to be martial arts pro. 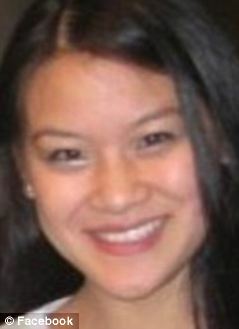 Priscilla Dang, 23, was targeted by the bike-riding teens while out jogging in Vancouver, Washington. One of the yobs pulled up in front of her, blocking her path, while the other grabbed her from behind. But they got more than they bargained for as she quickly sprang into action, drawing on her 18 years of Kung Fu training to teach the boys a lesson. ‘I grabbed [one of the boys] and said, “You need to apologize, and he did”,’ Dang told Katu.com. The second teen was less willing to admit defeat, however, and began swearing at her. ‘It just made something snap in me – it’s not OK. It’s so disrespectful,’ she said. She punched the teen twice, square in the face, while skirting his flailing fists. ‘He started coming in for a few, and I was lucky enough to dodge his shots. I came up for another one and I got him good, and I think that upset him,’ she told the news station. It upset him so much, in fact, that he pulled out a knife, which Dang shielded herself from with his bike, the news channel reported, before deciding to back off. 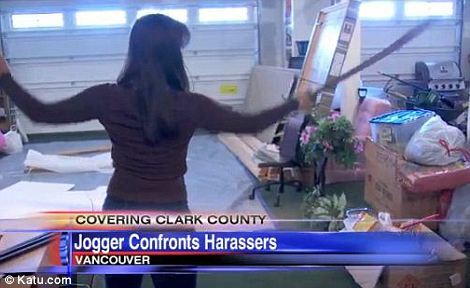 She escaped without injury and said she thinks she taught the thugs a lesson. ‘I think they knew they messed with the wrong girl,’ she said. Two witnesses called 911 and one of the attackers, 18-year-old Josiah Sullivan, was arrested. A younger boy, aged 16, was taken home to his parents and will be judged by a juvenile prosecutor. Investigators did not find the knife, which Dang said had a four-inch blade.